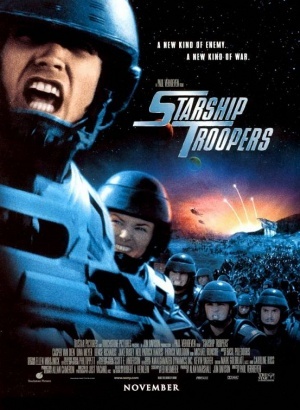 Starship Troopers is the 1997 feature film adaptation of the classic Robert Heinlein sci-fi novel of the same name that followed young men and women in the future society who volunteer to fight an alien force that perpetrated an attack on planet Earth. 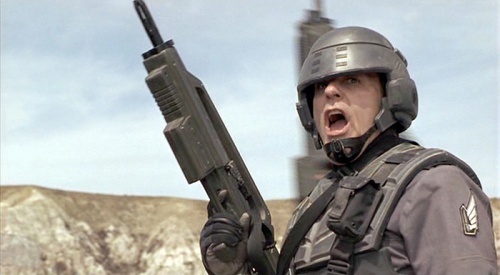 Helmed by RoboCop director Paul Verhoeven, the film was more of a commentary on a fascist society rather than a direct adaptation of the source material. 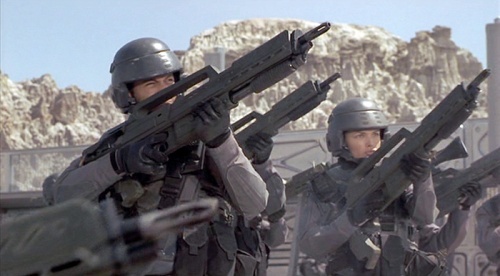 According to the film's weapons coordinator Robert "Rock" Galotti, Starship Troopers expended over 300,000 blank rounds during the course of filming (a then-record number for Galotti). 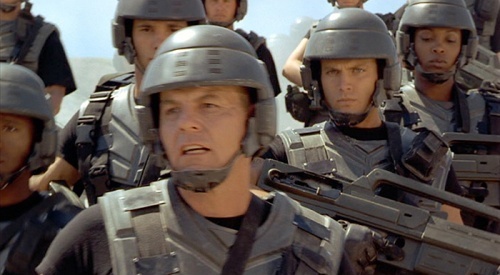 Two DTV sequels followed: 2004's Starship Troopers 2 (where no real firearms were used in the production) and 2008's Starship Troopers 3: Marauder. 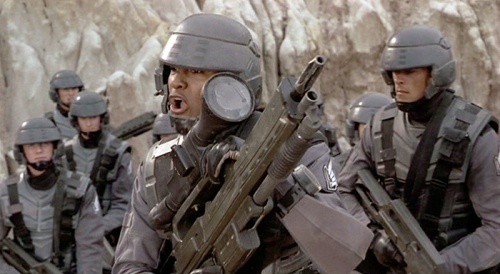 The Morita series of rifles are the main weapons used in the film, consisting of several variants. 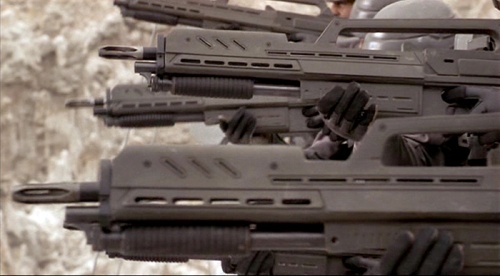 The standard Morita rifle is used by Rico and all the other Mobile Infantry soldiers. The full sized Morita MK I is built around the Ruger Mini-14 / AC-556 rifles with with an underslung Ithaca 37 shotgun. The Ruger AC556 used is housed in a modified Muzzelite MZ14 Bullpup stock. The full sized rifle has the short barreled Ithaca Model 37 mounted underneath the barrel (For convenience, a majority of the Ithacas were actually metal mockups with working slides, with only the real Ithaca being used in a scene with it firing). These weapons also feature an M60-style muzzle brake. Full-size Morita MK I Rifle prop. The M60 muzzle brake seen in the film has been removed from this particular weapon. 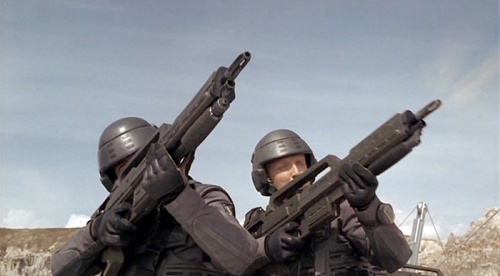 Johnny Rico (Casper Van Dien) and Ace Levy (Jake Busey) level their Morita Rifles at a flying bug. 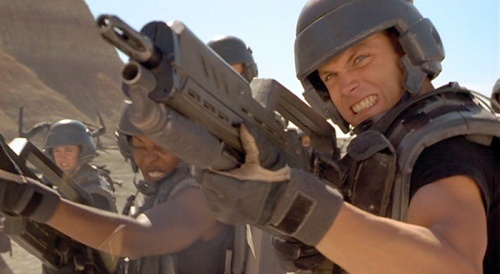 Johnny Rico (Casper Van Dien) and Dizzy Flores (Dina Meyer) fight with their Morita Rifles. An impressive lineup of Morita Rifles. Either the shot is reversed or all the actors are aiming their rifles "Southpaw" or Left handed. Front detail of Ricos' Morita Rifle. Example of the large flash from the Morita Rifle. Closeup of the Ruger AC556 Action in the shell of the Morita Rifle. Note the spent shell casings as the AC556 fires full automatic. One instance where we see the underslung Ithaca Model 37 Shotgun being fired, is by Rico when he is wounded. The other time Rico again fires the underslung Model 37 is at Whiskey Outpost, when he kills a Flying bug, who then lands on and kills General Owen (Marshall Bell). Also when we first see Rico use the shotgun, it fires more rounds than the Ithaca can hold. 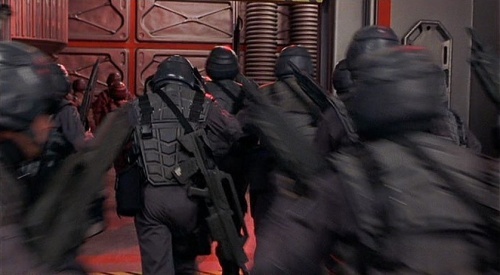 The shorter Morita Carbine is carried by NCOs, fleet pilots and officers. It is the same Ruger AC556 based Muzzelite Custom stocked rifle as the full sized Morita, except with shorter barrel and forend and missing the Ithaca 37 shotgun. The "hero" version of the Morita MK I Carbine. 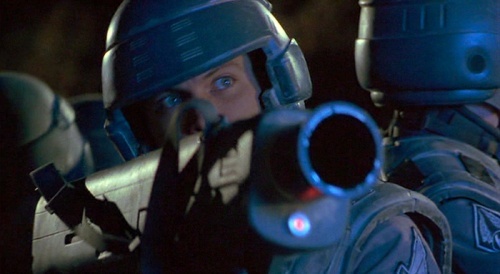 Lt. Jean Rasczak (Michael Ironside) uses a Morita Carbine to fire down at the bugs. 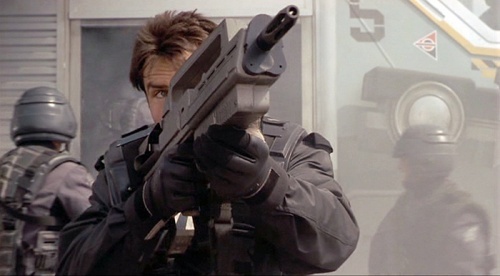 Fleet Pilot Zander Barcalow (Patrick Muldoon) uses a Morita Carbine during the rescue. 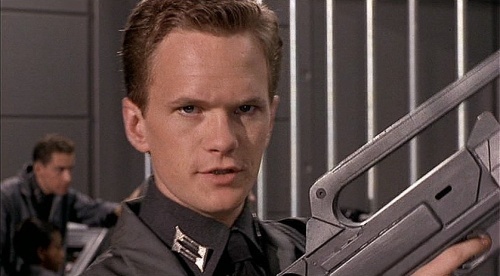 Colonel Carl Jenkins (Neil Patrick Harris) uses the Morita Carbine to demonstrate the best way to take down a bug. 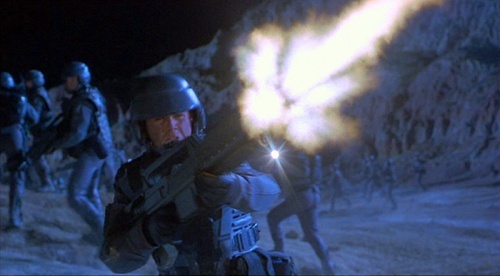 Col. Carl Jenkins opens fire with the Morita Carbine to take down a bug. 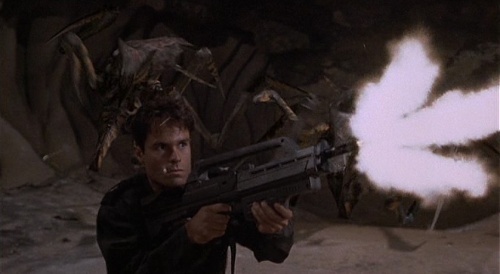 Fleet Pilot Zander Barcalow (Patrick Muldoon) fires the Morita Carbine in the cave. Both actors do a great job of keeping their eyes open throughout this scene. 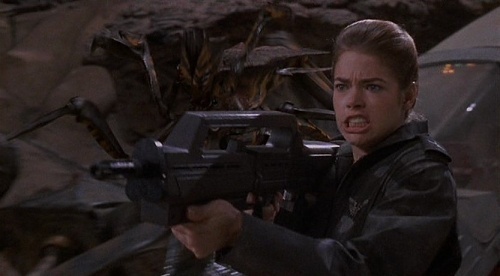 Fleet officer Carmen Ibanez (Denise Richards) fires the Carbine. 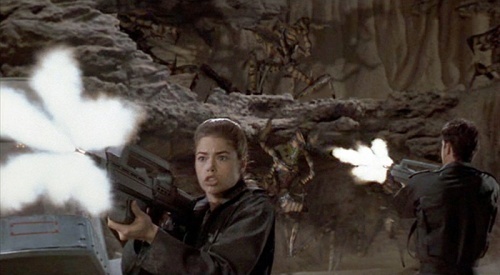 Fleet officers Carmen Ibanez (Denise Richards) and Zander Barcalow (Patrick Muldoon) are trapped in the caves, using Morita carbines to defend themselves. Note the incredible flash that the .223 blanks generate in low light conditions. 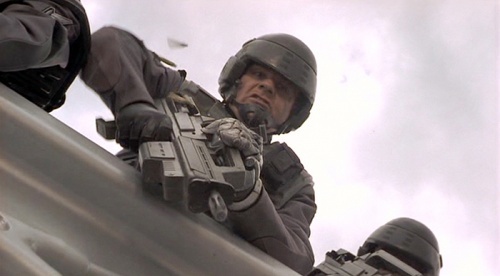 Lt. Rico (Casper Van Dien) is briefly seen with the Carbine as he leads troopers into battle. 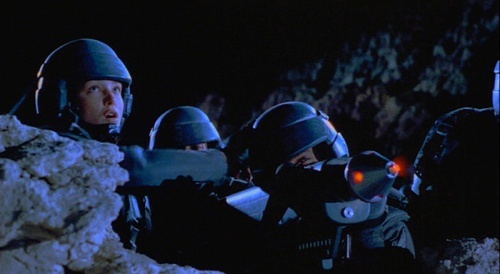 The Morita Sniper Rifle is merely a Morita with a large variable-power scope. It is the main weapon of Private Watkins (Seth Gilliam). It is also briefly used by Lt. Rasczak. It is the same basic weapon with the addition of an advanced scope capable of tracking and zooming in on a target. Pvt. Sugar Watkins (Seth Gilliam) aims his Morita Sniper on Tango Urilla. Pvt. 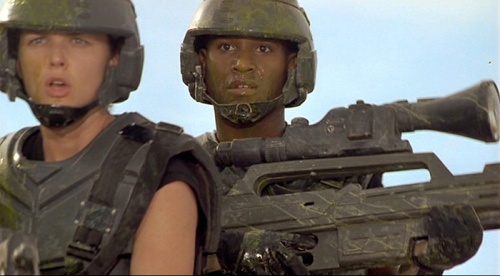 Sugar Watkins (Seth Gilliam), covered in Bug goo, watches a battle. 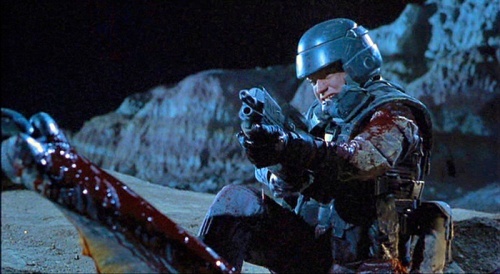 Lt. Jean Rasczak (Michael Ironside) takes Watkin's rifle and shoots his RTO who has been taken by the bugs. Pvt. Sugar Watkins (Seth Gilliam) extols his comrades to greater feats of heroism. The Mini-Nuke Launcher (called the MK55 Tactical Nuclear Launcher by some) is a small man portable nuclear missile launcher that comes with a suitcase outfitted with six portable nuclear missiles. Each missile must be assembled from two pieces and armed prior to front loading into the launcher. 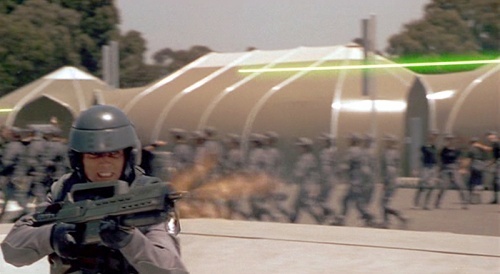 It is used by the Troops on Klendathu to take out the Plasma bugs and Rico uses it to Destroy the bugs coming out of the tunnel. 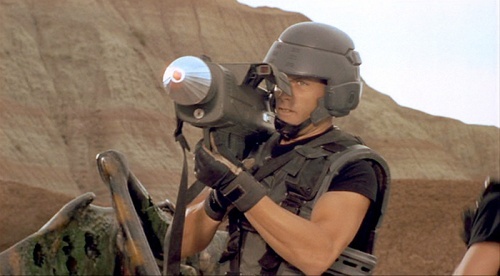 What is interesting is that the 'loaders' go out of their way to tap the helmet of the firing soldier (several times "blocking" the firer's field of view), but unlike the M1 "Bazooka" the MK55 is not loaded from the rear, but from the front, so the firing soldier can clearly see that it's loaded. The loader doesn't have to tap the firer's helmet, but the director was mimicking all things World War II at this point. Note: Different sources call it different things. The original armorer just called it "the rocket launcher", but that name is just banal. For lack of a better name, the term "MK 55 Tactical Nuclear Launcher", the name ascribed to the collectible toy replica of the weapon, will be used. The MX-90 resembles an standard grenade but packs a big punch. It is used by Rico on Tango Urilla and by Dizzy on Planet P. One can ready the grenade two ways. By pushing the red button, the spoon flies and you have the standard 3-5 second delay before explosion. Or you can remove the spoon and delay pushing the red button. Then when you push the red button, the grenade is on hold until you release. In theory (courtesy Hand Prop room). 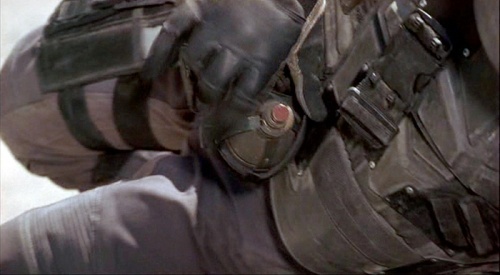 Johnny Rico (Casper Van Dien) MX-90 Hand Grenades in his web gear. 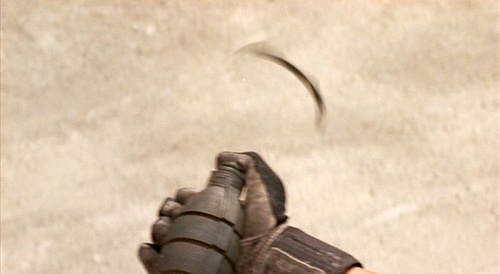 Flipping the spoon on a MX-90 Hand Grenade is too easy, just push the red button. 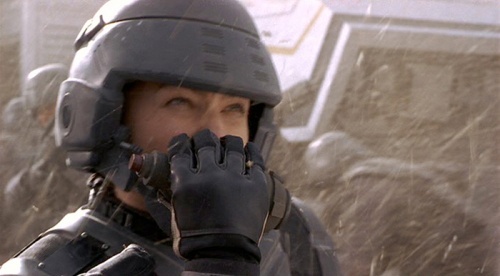 Dizzy Flores (Dina Meyer) pulls the spoon off of the MX-90 Hand Grenade with her teeth. 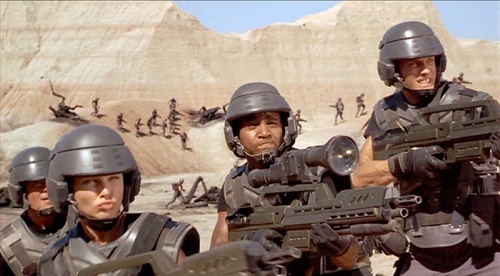 The new improved battle rifle of the Mobile Infantry is shown at the end of the movie is shown destroying the top of a hill in a large explosion. Unlike the first model, this has no live firearm housed inside. It is a completely fabricated prop, made out of vacuum formed plastics, aluminum and resin. 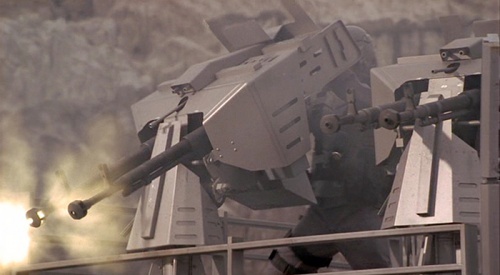 The twin heavy machine guns at Whiskey Outpost on Planet P were Fake Soviet era DShK heavy machine guns. These were Browning M2HB .50 cal machine guns that were outfitted with modified DShK barrels. At the time of the movie's production, DShK barrels were available, but the whole guns were not available in the chain of commerce in the U.S.. 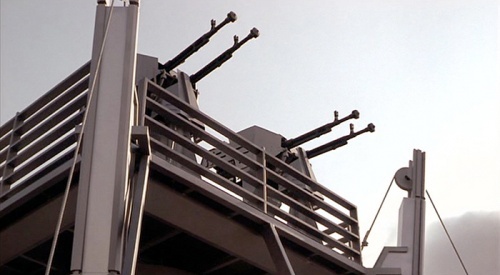 Most of the Russian DShK Machine guns seen in films of this time period are these modified Browning M2 .50 cal guns with original Soviet barrels attached. 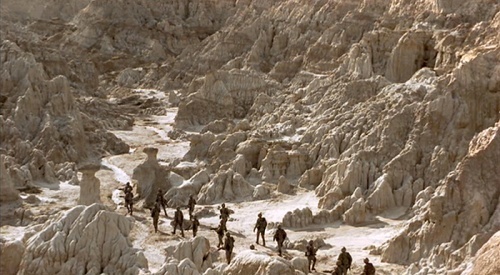 Since they were filming these sequences in a national park, the production had to make sure that they didn't damage any of the permanent geological structures. Unlike a Western movie, there was serious bug splatter, pyrotechnics and ground explosions. 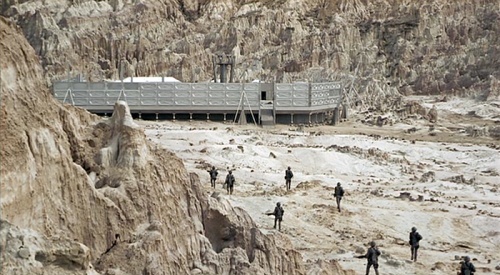 One of the scenes where Rico fires a nuke is actually on a man made sand dune on a Southern California backlot. 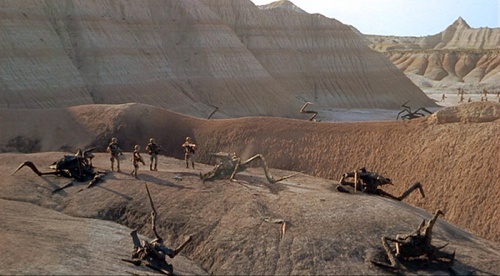 All the dead bugs and debris had to be carefully removed after filming, and any especially messy sequences were either inserts from a California set or CGI. This area has been used many times in Western films, from How the West Was Won to Dances with Wolves. What many people don't know is that the neck wrap was made from rubber wet suit material, and the jacket was a thick rubberized cloth. Frankly, it was hot in those outfits, especially while wearing the rubber outer armor. During filming in Badlands National Park in South Dakota, it was nearly 110 degrees and actors were as serious risk for heat stroke. During this one scene, they opted to let the actors and extras wear only their black T Shirts under the armor. A heat wave dictated the costume change. Mobile Infantry in the 'modified' uniform. The set of the Whiskey Outpost on Planet P was built in Hell's Half Acre in Wyoming. The entire region of the U.S. at the time was suffering from a heatwave, however, filming in Wyoming was helped by several days of overcast and semi overcast skies, which helped keep the rocks from reflecting the sun's heat. Mobile Infantry walking in Hell's Half Acre, Wyoming U.S.A. The impressive exterior shell of Whiskey Outpost in Hell's Half Acre, Wyoming U.S.A. Other scenes within the outpost walls were filmed in Southern California backlots. Of note is the somewhat over the top scene in boot camp where the recruits are training with "live ammo". This exercise ends with the death of a recruit and the punishment of Johnny Rico. However, any firearms person (or military person) would cringe at the completely unsafe environment for a live fire exercise (as well as the questionable parameters of the training exercise to begin with). 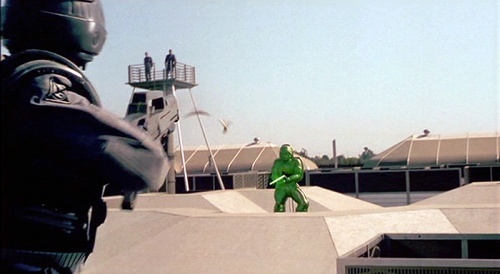 The ridiculousness of this was even acknowledged in the film's DVD commentary, as director Paul Verhoven said they wanted to construct this area in a completely different place, but were hampered by budgetary constraints. 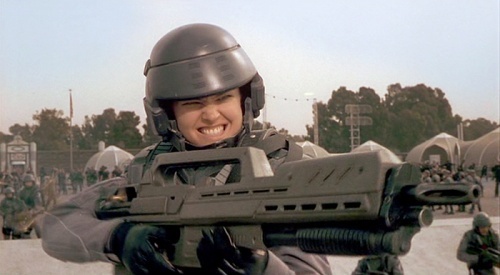 Dizzy Flores (Dina Meyer) runs with her fully loaded Morita. In plain sight are other recruits marching. There is no backstop to protect others from errant rounds. Rico fires his Morita ... while running over an obstacle course! Clearly visible are the other recruits marching on the parade grounds. One can barely create a more UN-safe environment to be firing live weapons. Firing a Morita at a target, observers in the tower are in a clear danger area as they can easily be hit by errant rounds. 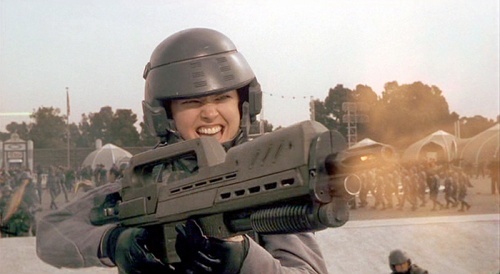 Dizzy Flores (Dina Meyer) fires her Morita rifle, again with others clearly unprotected, just walking in the background. And this is what happens in unsafe "live firing" exercises ... Note: the dummy prosthetic head for Breckinridge (Eric Bruskotter) is quite realistic. 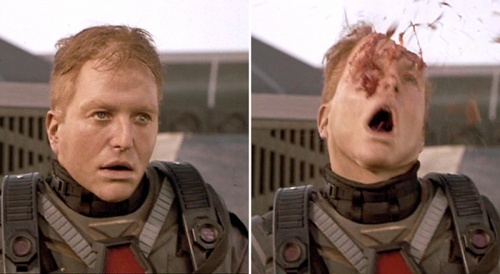 The eyes and mouth actually move before getting blown apart by a pyrotechnic charge. Originally, the Morita rifle was going to be based on the "M60 E". The original Morita was designed by prop fabricator Bear Burge. Once the design was approved, the studio commissioned the construction of a prototype, which features metal, plastic, and wood attachments added to the M60 to alter the look of the weapon. 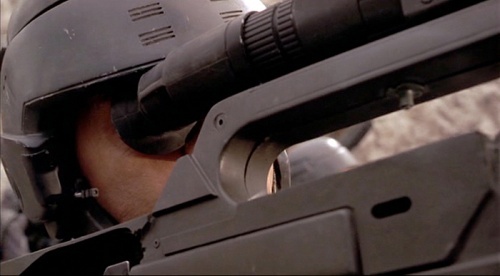 Ultimately, the M60-based Morita only appeared in test footage for the film and the weapons actually used were built around Ruger Mini-14 / AC-556 rifles in modified Muzzelite MZ14 Bullpup stocks. 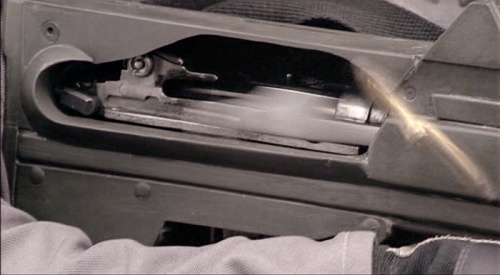 However, the film-used Moritas did feature M60-style muzzle brakes. 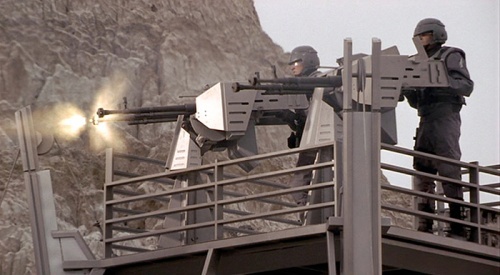 Production-used prototype Morita (the same one mentioned above) from Starship Troopers. Note that this included the original sketch of the M60, an approval letter from the producer, plus additional edited photocopied design modifications, when it was auctioned in 2012. 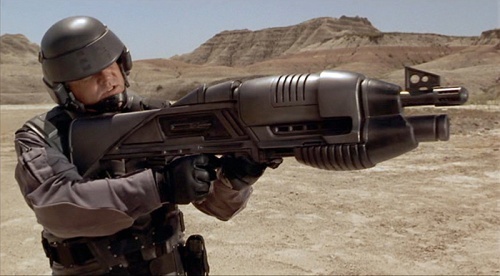 Opposite side view of the prototype Morita from Starship Troopers.